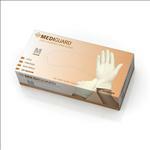 MediGuard Non-Sterile Powdered Latex Exam Gloves; MUST CALL TO ORDER . MediGuard® powdered latex gloves offer excellent sensitivity, making them ideal for almost any application. � Powdered with medical grade absorbable dusting powder(USP) for donning ease, they're non-textured with beaded cuffs for added durability. � Meets all ASTM and FDA requirements. � A great overall value.